What Does Code P0192 Mean? Despite the fact that the internal combustion engine is essentially the same as it was a century ago, in the ever-onward pursuit of better fuel economy and performance, automakers have discovered a number of ways to extract more power and fuel economy out of it. Direct fuel injection is nothing new, also having been invented more than a century ago. Today, all diesel engines and many gasoline engines are taking advantage of the benefits of high-pressure fuel injection, directly into the cylinder on compression. Direct fuel injection delivers more power, better fuel economy, and lower emissions. On some modern cars, those equipped with high-pressure fuel injections systems, there are two fuel pumps. The low pressure (LP) pump is located in or near the fuel tank, while the high pressure (HP) pump is located on the engine. The LP pump usually runs between 35 and 75 psi, which is used to feed port fuel injectors, if equipped, and the HP pump. The HP pump uses mechanical energy, usually from a camshaft, to ramp up fuel pressure to feed the direct fuel injectors. The HP fuel pressure can range from 500 to 5,000 psi, depending on application. Diesel engines may or may not use an LP pump, which may put out something like 5 to 15 psi. The HP pump ramps up fuel pressure as high as 23,000 psi, depending on application. The ECM (engine control module) monitors fuel pressure for at least a couple of reasons. 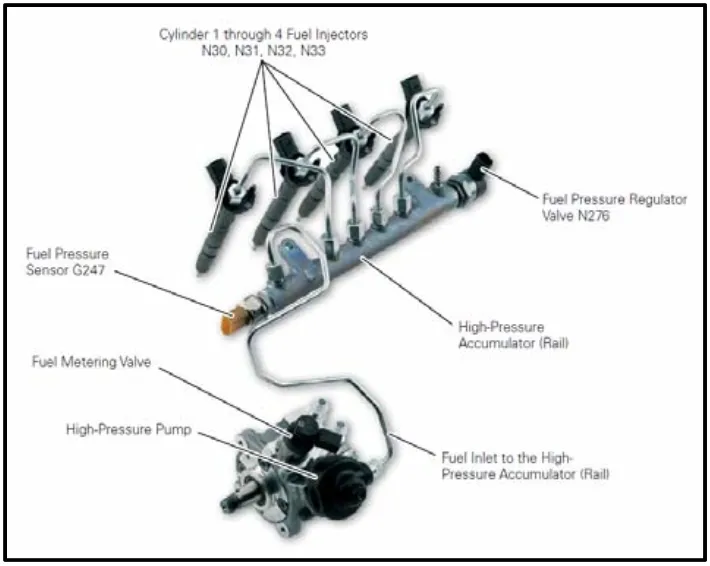 First, fuel pressure is important to modulate fuel injector pulse width. Generally speaking, higher fuel pressure requires less pulse width to get the same amount of fuel. Second, fuel pressure readings are used to modulate the fuel pressure regulator, which the ECM controls depending on driver demand and engine loading conditions. Finally, fuel pressure needs to be finely controlled to keep from damaging anything. With HP fuel rail pressures ranging from 5,000 to 23,000 psi maximum, overpressure conditions could easily lead to component failure and leaks, such as from ruptured fuel lines or fittings. If the ECM detects a problem with the fuel rail pressure sensor (RPS), such as insufficient or excessive voltage feedback, or an open or short circuit, it will lock out the HP pump and put the engine into limp-home mode. The MIL (malfunction indicator lamp) will be illuminated, and a DTC (diagnostic trouble code) will be set in ECM memory. DTC P0192 is defined as Fuel Rail Pressure Sensor Low Input. What are the common causes of code P0192? Depending on year, make, and model, DTC P0192 may have number of causes. Here are some of the most common. 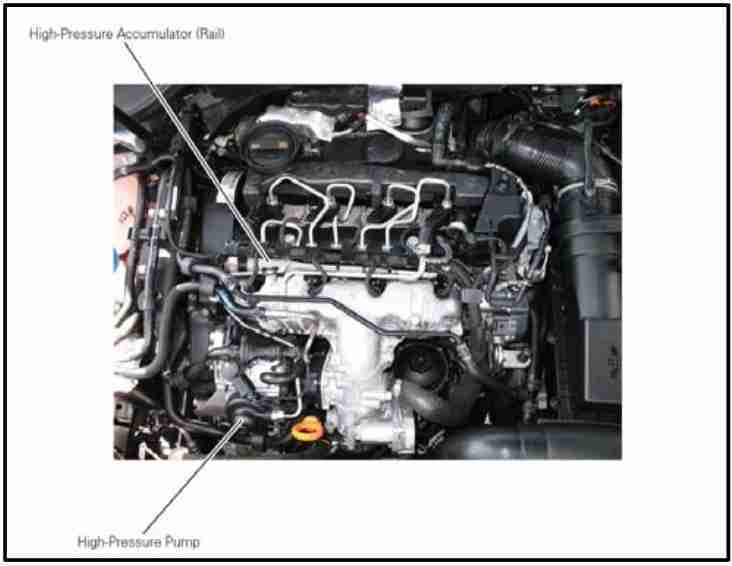 RPS Failure – The fuel rail pressure sensor, like most semiconductor sensors, is prone to failure from heat and vibration, both of which are present in abundance in the engine compartment. This is the most common failure in the system. What are the symptoms of code P0192? Depending on the failure mode, the engine may not start, or may start and run, but poorly. You will, at the very least, experience a loss in power and decreased fuel economy. Vehicles with both port and direct injection may not exhibit such drastic drivability problems, but this doesn’t mean you should simply keep driving it in its present condition. How do you troubleshoot code P0192? Circuit Low Input codes are often the result of low battery voltages (that can have many possible causes), bad connections across electrical connectors or previously repaired wiring, as well as corrosion in electrical connectors. Other possible causes of low input voltages include poor installation of aftermarket components, poor quality aftermarket components like fuses, relays, and switches, and modification of the electrical system that could include the use of conductors that are not rated for use in a particular application. However, poor connections often result in high resistances in some parts of the circuit, which is why it is important to perform resistance and continuity checks during the diagnostic procedure. Depending on the vehicle, the RPS generally has an operating voltage range. Some Toyota RPS, for example, function between 0.5 V and 4.5 V, measuring 0 psi to 1,885 psi. To diagnose the RPS and its circuit, you’ll need a DMM (digital multimeter) and vehicle-specific EWD (electrical wiring diagram) and repair manuals. General Check – Check wire harnesses for obvious damage, such as from chafing, poor routing, or other damage. Check connectors for bent or broken pins or corrosion. Make sure all connectors seat properly. Repair as necessary. Circuit Check – Disconnect the ECM and RPS. If no circuit problems are found, suspect a faulty sensor, but test (if possible) before replacing it. Check each line for continuity end to end. Resistance should be less than 1 Ω. Repair as necessary. Check each line for short to each other and to ground. Resistance should be over 10 kΩ. Repair as necessary. Sensor Check – All connectors firmly seated and KOEO (key on engine off), backprobe the RPS or ECM and check voltage against repair manual specifications. Using our Toyota example, there should be a 5 V reference voltage (Vref), ECM ground, and RPS signal. If circuit checks and sensor checks pass, suspect and ECM fault, but do not condemn the ECM until you have the system checked by a professional. If Vref, RPS, and Ground is 4.5 – 5.5 V, suspect an open ground circuit. If you’ve ruled out the circuit itself, it may be internal. 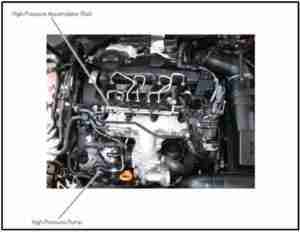 Repair wire harness or replace sensor. If Vref is 4.5 – 5.5 V and Ground is 0 V, RPS should read between 0.5 V and 4.5 V. If otherwise, replace the sensor. You may be able to measure resistance directly on some pressure sensors. Disconnect the sensor and measure across the terminals, comparing to repair manual specifications. If outside of specification, replace the sensor. The fuel rail pressure sensor is on the end of the fuel rail. I’m guessing that it’s probably plugged in and all, but make sure there is no corrosion in the plug and that the wire harness is undamaged between the ECM and the sensor. You’ll need an EWD to see which line should be 5 V. If voltage is bad here, such as from a bad ECM (not likely) or corrosion (due to damage or water intrusion), then the ECM won’t be able to read it. Check for resistance between the ECM and the sensor on all three lines. You should have 0 Ω end to end and over 10 kΩ across them and to body or chassis ground. Internal resistance is also a possibility, but I would check the rest of the circuit first, before you condemn the sensor.